"The Future of Food is Food"
Steve Case is an important investor and entrepreneur (AOL). He recently wrote a good article called "The Future of Food is Food"
There are so many people touting goofy food trends that it's hard to keep up. What Mr. Case brings us back to is the fact that someone has to grow real food and someone has to prepare it. This is not manufacturing. This is not an app. This is not counting users. This is food. Part way through the quote below Mr. Case asks if Google would be serving powdered food and drinks to its employees. I don't think so. The world needs small, regionally based production kitchens that can capture, stabilize and move to market the millions and millions of pounds of food that are wasted every year during the harvest. There is just no way to save it without minimal processing and a way to store it for year-round use on a commercial scale. That's what our friends at the Wisconsin Innovation Kitchen do. They take real food from real family farms in the Upper Midwest and turn it into delicious ingredients for year-round use on menus across the region. They also take treasured recipes - and exciting new ones - and turn them into real food products and brands that food entrepreneurs can build careers on. Nothing being made into 22nd century food powders. Sure there will always be new ways of growing food and certainly new ways will arise to store and preserve it, but those efforts will be in support of real food not 'food like substances'. That's what they do at the Wisconsin Innovation Kitchen. Astronauts may have started out drinking Tang, but now they're growing leafy greens on the International Space Station. "Do we need healthier food and a cheaper way of sourcing and distributing that food? Absolutely. But that’s not a powder. It’s authentic, natural foods, locally sourced, sustainably grown, brought fresh to our tables." "Or let’s take Google. Google’s culture thrives on collaboration, which includes a buzzing and healthy in-house dining experience for everyone to mingle and relax. I doubt Google would dream of firing their chefs and replacing their buffet with powdered drinks." "In fact, some of the best ideas I have ever been part of have come over a shared meal. I remember having sushi with Steve Jobs when he was outlining his vision for the iPod, and being moved by a conversation I had with Nelson Mandela in his home after lunch about the rise of Africa. And not a week goes by when I’m not inspired by an up-and-coming entrepreneur, sharing his or her vision for a better world as we break bread." "That is sad. That is not what Silicon Valley disruption is about. What are we innovating for, who are we building the future for, if we don’t value human connection?" "In my opinion, Michael Pollan had it right when he urged us all to eat 'real food,' avoid 'edible food-like substances' — and 'don’t eat anything your great-grandmother wouldn’t recognize as food.'" "Sometimes revolutions take us forward by taking us back." Amen. You should check into Innovation Kitchens. The Future of Food is Food. By Steve Case. It's a good feeling to be able to support entrepreneurs globally. It's especially nice when Kiva makes it so easy. About 95% related to agriculture and food entrepreneurship. Kiva has a 98.59% repayment rate. Kiva currently has about 1,341,049 individual lenders who have made about $759,301,075 in loans globally. I'm proud to be part of this story. I've included a link at the end if you'd like to learn more. 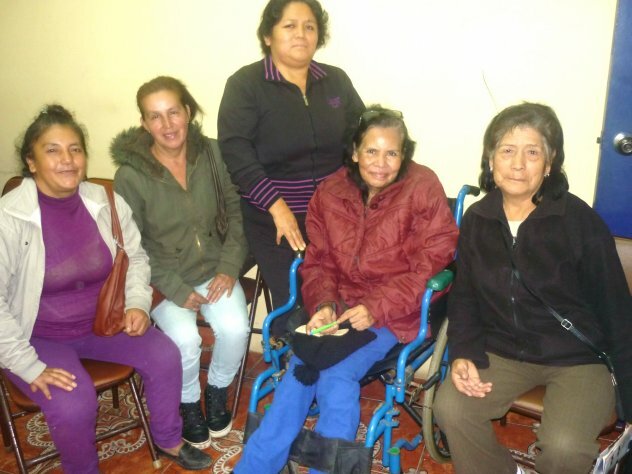 "The 'Cristo el salvador' communal bank is made up of 5 responsible women who want to get ahead in life. In the new cycle the group is represented by Vilma, who is 50, single and has 4 children, 1 of whom still depends on her. She has a business selling all types of food that she prepares for her customers herself with a lot of hard work. That is why she will use the loan to buy an renew her utensils, such as pots, stirring spoons, plates and cutlery she needs to be able to serve and sell better. This is how Vilma generates her own income with a lot of hard work and dedication, to offer her son a better quality of life. In future, she plans on doing buffets for all types of events, because she is the best at that. In the group photo, Vilma is standing among the other members, who are seated." "Innovation Kitchens is on the forefront of the eat local movement." Great to see the shout-out for our business in the new Willy Street Co-op Reader. In the Upper Midwest we're being cited as a possible food supply solution to the California drought. Creating regional food processing systems to diversify the risks involved in California-centric models seems smart to me. But what about the glut of locally grown summer produce? Minnick said an exciting new partnership between the Co-op and a local venture might help Owners take advantage of that surplus and more throughout the winter. Willy Street Co-op is in the beginning stages of what could become a very cool partnership that would bring Wisconsin’s summer produce to the Co-op’s shelves and freezers throughout the winter. Located less than 60 miles southwest of Madison in Mineral Point, Innovation Kitchens is on the forefront of the eat local movement. 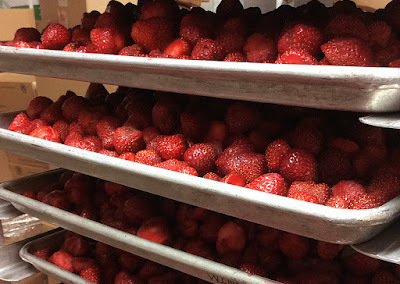 The commercial kitchen offers light processing that stabilizes produce – via freezing, canning and pickling – which Minnick said will provide another avenue for Owners to minimize their winter dependence on California produce. The partnership actually began in 2014 when all of the Co-op’s pumpkin pies were baked with local pumpkins pureed at Innovation Kitchens. This year, the partnership will bring locally grown broccoli to the Co-op’s freezers after it is prepared and frozen at the Mineral Point facility. “It’s in the inception stage right now” Minnick said. “A lot depends on how this broccoli deal goes, which was kind of our toe in the water.” Ideally, Minnick said, if the frozen broccoli goes well, the Co-op will partner with Innovation Kitchens to bring a few other products into the Co-op shelves yet this winter. If that goes well, Minnick foresees a much more coordinated effort in future years that would greatly expand the Co-op’s Wisconsin produce offerings during the winter. “Every year we meet with local growers in the winter and scope out the year to come,” Minnick said. “Hopefully if these things work out the way we hope they will, we’ll be able to talk to our growers this winter and say ‘Hey can you plant two acres of tomatoes just for this?’” If all goes well, the partnership could bring new growers into the fold simply for winter-use contracts. “Ideally, we’d be actually contracting for large quantities,” Minnick said. Innovation Kitchens CEO and Founder Rick Terrien said the kitchen’s business model is the first he is aware of in the United States. “We’re a small, regionally based co-packing facility”, Terrien said. “We can focus on inbounding and sourcing local produce from local farms, and processing it minimally.” In addition to its work with Willy Street Co-op, Terrien said Innovation Kitchens contracts with some area schools and hospitals, as well as local food producers like RP’s Pasta. California Drought. 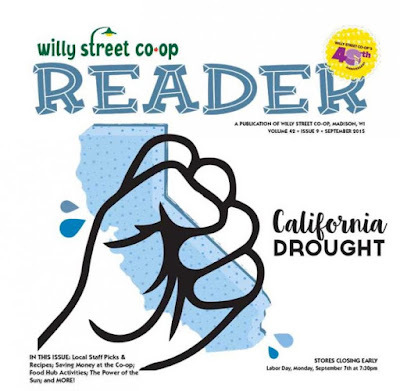 Full article in the Willy Street Co-op Reader.